David Helsham brings a seasoned designer’s eye to photography, having operated a successful graphic design agency in The Rocks, Sydney for more than 20 years catering to the needs of blue-chip corporate clients. He has a lifelong interest in fine arts and in the late 1990’s he embraced photography with a passion matched only by an obsession with ocean swimming. 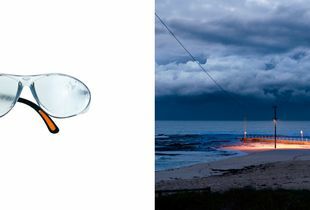 Bongin Bongin Bay and its surroundings in northern Sydney Australia provide the raw material for this magical series of diptychs. Photographer David Helsham often juxtaposes found objects he discovered on the beach – from discarded toys, to shoes, to skulls – with views of the bay in all weathers and seasons.